You don’t have to wait for the farmer’s market this summer to enjoy delicious and wholesome farm-fresh food. Modern Market, located in The Promenade Shops at Briargate, offers plenty of colorful and nutritious meals. The healthy eatery local to Colorado offers something to please anyone’s taste buds. Modern Market’s goal is to provide healthy and tasty foods at a reasonable price. Their menu options have little to no added sugar, plenty of healthy fats and a variety of delicious vegetables. Paleo, vegan, vegetarian and gluten-free options are available, but that doesn’t mean the menu is limited to carrot sticks and tofu. If you’re not vegan or vegetarian, there are plenty of other options to choose from, and you won’t be disappointed in any of them. Modern Market serves locally-crafted, natural soda, coffee, beer and wine. Aside from the options my parents, whom I treated to dinner, and I went for, there were also pizzas, flatbreads, superfood salads and seasonal soups to choose from. Employees are friendly and personable. Our food was ready in less than five minutes, which is especially impressive considering we went around the 6:30 p.m. dinner rush. I opted for the Chicken Breast Homestyle Plate ($7) with a side of Roasted Garlic Mashed Potato ($2) and the Greens and Balsamic Salad ($1). It was delicious. The chicken was perfectly cooked and came with a side of salsa verde, which added a lot of flavor. The mashed potatoes were creamy and buttery without an overpowering salty flavor. If you enjoy sweet potatoes, the menu also offers a Rosemary Sweet Potato Mash for a slightly lighter option. Strangely enough, my favorite part of the meal was the Greens and Balsamic salad. The mix of spinach and arugula provided a variety of textures and the balsamic was the perfect combination of sweet and tangy. It’s a simple salad, but I could eat it every day. My parents were also impressed by the menu options and food. My dad went for the Humanely-Raised Steak Plate ($8.50), Mac & Cheese ($2) and the Arugula and Bleu Cheese Salad ($2). The steak was slightly underdone for my taste, but he enjoyed it. The Mac & Cheese was creamy and smooth. The restaurant served a reasonable portion that won’t leave you feeling bloated and uncomfortably full. My mom had the Tender Belly BLT+A ($8.75) with nitrate-free bacon, fresh tomatoes and herbs between two slices of hearty multigrain bread. The avocado was a delicious and healthy touch to an old-school sandwich. The atmosphere is nearly as beautiful as the food. As the name states, it’s modern and trendy of course, but you don’t feel out of place if you don’t look like a hipster. The dark wooden tables, sunshine-yellow chairs and posh details are any interior design lover’s dream. The setup in the front of the store can become crowded at mealtimes, but the service is quick enough that the chaos doesn’t last long. Besides the delicious food, it also feels great to support a local business. Fast food isn’t limited to Burger King and Jimmy Johns. 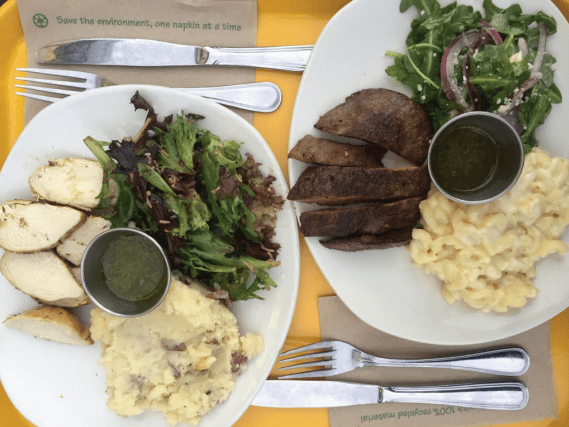 Next time you need to grab a quick bite, try Modern Market to go or dine in. It’s light, delicious and will leave you with energy to tackle the rest of the day.